Flurry the Bear is a novel series for people of all ages. It’s family-friendly and written at a level suitable for ages 7 – 14. The books contain epic fantasy adventure and action to keep you on the edge of your seat. The tales follow a young bear cub named Flurry. He and his friends go toe-to-toe with the most evil villains ever known. If you like grizzly bear pirates, red panda samurai, feline assassins, Viking polar bears, Mayan cats, wolves, elves, sword fights, battles, and more, then this is the novel series for you. Flurry the Bear was first conceived in 2008 by J.S. Skye. Flurry began with short comic strips which illustrated Flurry's day-to-day life in a distant modern-day country named Middleasia. The comic strips were intended to be short, cute, and humorous. Over the course of the comic shorts, Flurry developed a fan base that frequently asked about Flurry’s origin. In 2012, J.S. Skye decided to write a short novel to explain where Flurry came from. The first novel focused on a little village named Ursus. The village existed on another world named Ahelia, and sat in a snowy valley in the northern territory of Mezarim. Flurry's world was inexplicably linked to our own through an invisible gateway. The land of Mezarim is ruled by a retired warrior named Christopher Kringle. He acts as lord over all his various territories in the north. Christopher’s reach extends as far south as the border of Urs and as far north as the human city of Polaris. The Kringles haven't aged much over the past 7,000 years. They age one year for every one-thousand years that pass for everyone else. This gift was bestowed upon them by a mysterious, well-respected, and renowned figure known simply as the Great King. In addition to this gift, Christopher has been granted the ability to give life to anything he sees fit. His wife, Catherine, has extremely keen senses that far exceed the ability of most people. In the bear village of Ursus, a lottery was held. The winner would be granted one wish. Mr. and Mrs. Snow were chosen. Their wish was to have a bear cub of their own. Christopher granted the Snow family’s request. Christopher spoke life into the bear, but something unexpected happened: the bear had the ability to speak two different languages. Christopher took note of the unusual circumstance and kept his eye on the cub over the years. The cub was named Flurry, because his fur was whiter than snow. Flurry was deeply loved and admired by almost every bear in Ursus, but this attention quickly went to his head. The young cub became stuck on his cute looks, and it spawned a great deal of pride and vanity in his heart. Due to Flurry's pride, he found himself in a distant land on another world known as Earth. 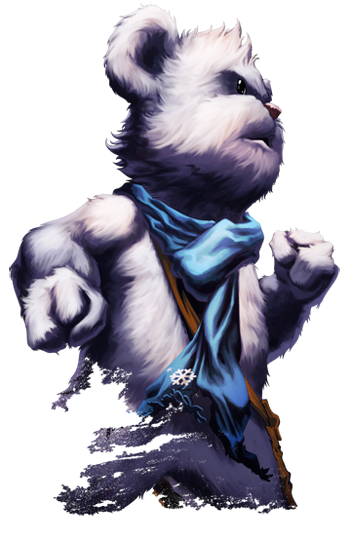 Christopher refuses to allow Flurry to return to Ursus until he’s learned his lesson in humility. Flurry settles down in his new home with a human family and meets his new friends Noah, Boaz, Caboose, and Honja. Together, Flurry and his friends embark on many epic adventures.